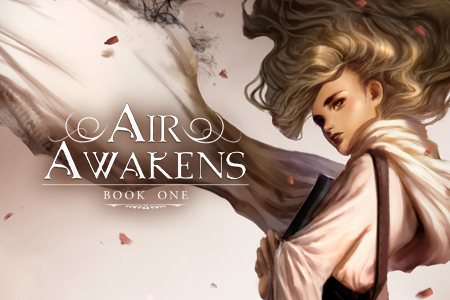 the third book in the AIR AWAKENS series by Elise Kova. As I'm sure you've seen, the covers for this series are GORGEOUS and done by the ever wonderful Merilliza Chan. I feel like with each new cover I see, I fall a little bit more in love with Merilliza Chan to be honest. Keep scrolling after the cover to see an interview with the artist about her process, background, and her favourite cover from the series! ANYWAY, you are here for the cover, so I shall give you the cover. Scroll to see! Vhalla Yarl has made it to the warfront in the North. Forged by blood and fire, she has steeled her heart for the final battle of the Solaris Empire's conquest. The choices before Vhalla are no longer servitude or freedom, they are servitude or death. The stakes have never been higher as the Emperor maintains his iron grip on her fate, holding everything Vhalla still has left to lose in the balance. Um hi, I'm dead. This cover, this synopsis. I can't handle it. Catch up on the story by reading AIR AWAKENS and FIRE FALLING! I use various tools to create artwork. When starting out with ideas I prefer making them on my sketchbook first, not minding specific details and just having fun with idea generation and doodling. This is the stage we call "thumbnails". The next step I usually use the digital media to finalize the thumbnails, but sometimes I go straight out and sketch my favorite thumbnail to turn into a finished linesketch. As such, all my finished artworks are painted and done in Adobe Photoshop (CC 2014, currently), along with my old and trusted Wacom Intuos 4. What's your background? Did you study art in school? I finished university in 2014 with a degree of Bachelor of Finearts, Major in Advertising Arts. My Alma Mater is the University of Santo Tomas here in Manila, Philippines. The course I took focused on graphic design, branding and marketing for agencies, which is a very good background to have in any art industry. During our 3rd year to 4th year we had special classes we called "Electives" which are basically specialized classes, this was the time I decided on focusing more on digital painting and illustration, rather than going into graphic designing, so I took electives related to my chosen field. By the time I got to the thesis phase, which is the final requirement before finishing the course, I decided to take on Book Illustration. I've learnt many things from my background that if it weren't for it I'm not sure if I'll be able to do the same things I'm doing right now. The AIR AWAKENS series was my very first book cover series. I'm not going to lie that I first took interest on the project because it was an opportunity for me to finally work on the book industry. Any artist starting out would be uncontrollably excited when offered a project as such. And THEN I read the story, read about the characters, got to know an amazing client and author, a friend, and so there lies my true answer. It was the perfect project for me, I loved the world, I loved the characters and I loved the idea behind it all. And so I wanted to make sure that I make it very special. That's hard to say. I loved all of it so far! (Or I'm being extremely biased, because well, I worked hard on all of them! haha) But if I'm being asked as an artist I would probably say the first cover. 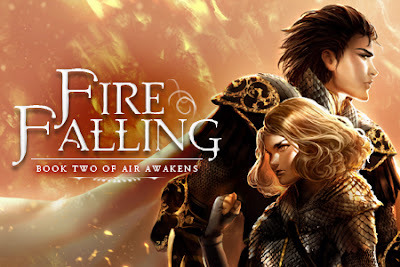 It was simple, straight to the point, saying, 'Hey, this is Vhalla, the Heroine for this amazing world/story'. I liked covers that has that iconic, unique feeling to it and so I would say that the first cover definitely did it for this series. 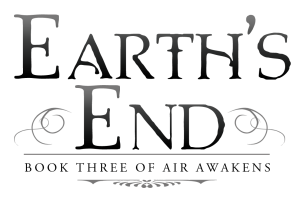 (Without any spoilers) What did you like about the third book in the AIR AWAKENS series: Earth's End? 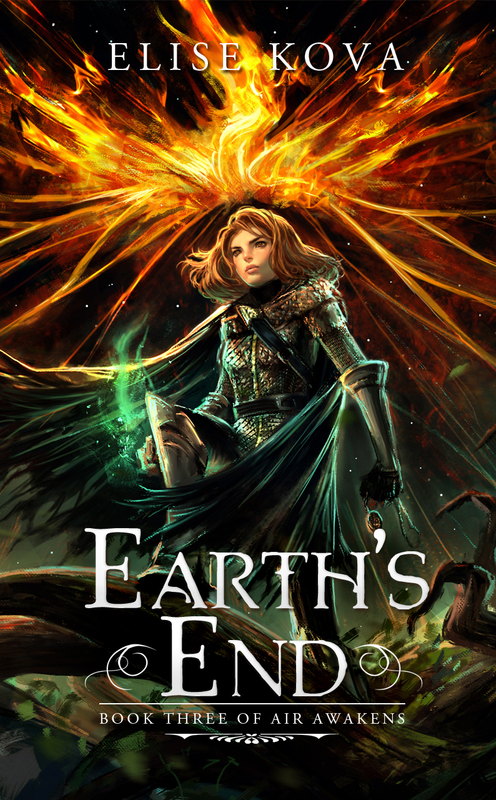 Earth's End is my favorite of the 3 books so far and my main reason is that it felt like everything was coming down together, finally! Especially for Vhalla. I loved the Vhalla in this book. The character has developed into something much more and although she's still probably transitioning, she's finally getting there. In general what I liked about Earth's End is that there's more action, more storyline focused on Vhalla and her world, there were more things learned about the other characters too such as Baldair, among many others. Elise has outdone herself with this one. What's one thing that you think would surprise people about the process of creating the AIR AWAKENS covers? Or, one thing people may not know? Elise has always told me that she and her author friends never expect their artist to read the whole manuscript. And I read the whole thing because well, I just couldn't help it. I have become very attached! She says I make the most 'official-est' fanart ever and I agree. 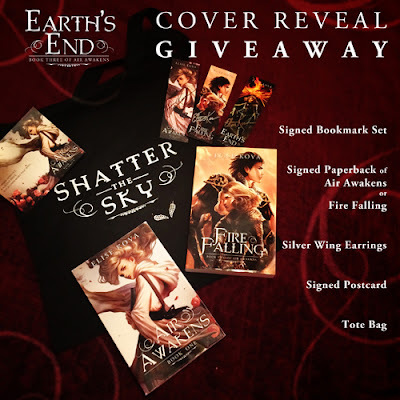 You can see more about Meril's process in creating the covers on her blog! 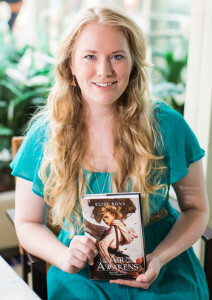 Elise lives in Saint Petersburg, Florida, where she's currently working on the next installment in her debut YA fantasy series: Air Awakens. She enuoyes video games, anime, table-top role paying games, and many other forms of "geekdom." She loves talking with fans on Twitter and Facebook. Visit her website, EliseKova.com, for news and extras about her books! The cover is gorgeous! It's very colorful and powerful. Can't wait! I am unbelievable excited for this novel to come out!! !